Our regular meeting place is The Lyme Regis Golf Club, Timber Hill, Thursdays "We meet at 6.30 for 7.00 pm with all food orders to be made before 6.45 pm" Any intending visitor may contact me for information of our meetings, either by email secretary@lymeregisrotary.org or by telephone 01297 560081. 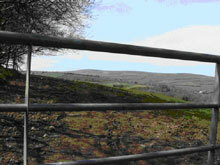 Exmoor Challenge. 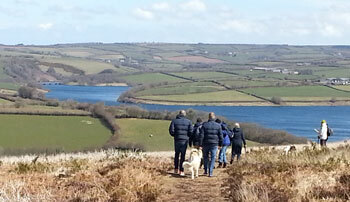 - The Rotary Exmoor Challenge is a gentle competition between Rotary Districts 1170 and 1200 for the Rotary Challenge Shield. A great chance for the Club to get involved and show what SERVICE means. We have prominently supported this event in Lyme Regis for many years and helped keep our beaches clean. This year the organisers will be at Charmouth on Saturday and Lyme Regis on Sunday, bags and 'pickers' will be provided. Can I urge the Club to see if we can have a good show at both these events, its only a couple of hours and such a great outcome when you see the bags and bags of rubbish which are collected. 17th Century Coaching Inn by the sea. A classic Quiz Night over supper. 2018 event was to raise funds to help Yeovil Rotary Club rebuild a school in Nepal: Shree Saraswoti School, which was destroyed by the 2015 earthquakes. Last year was a sell out so buy early 7.00 for 7.30pm Uplyme Village Hall. This annual event takes place in the lower part of Broad Street, around the Christmas Tree, is accompanied by music provided by the Lyme Regis Town Band, and refreshments kindly donated by a number of businesses in the town. 7pm The Shambles. All welcome. 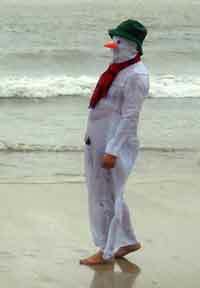 A fancy dress dip in the balmy waters of Lyme Bay, 1300 hours at the Cobb Beach. “If you would like to raise funds for the chosen Rotary charity: please feel free to use the sponsor form, where sponsors can sign up to Gift Aid if they wish. If you have your own charity which you wish to raise funds for then please go ahead. It would help our cause if you would just email us with the amount raised – If you just want a dip, feel free to join us, there is no obligation” From the Sandy Beach (time to watch the Duck Race First). 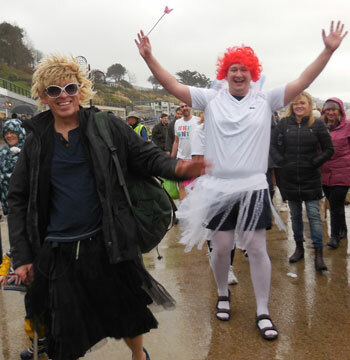 Wet suits allowed, preferably with fancy dress over the top, just a paddle in the sea is enough to say you've 'done the Lyme Lunge' for charity. In the 9 years we have run the Lunge just over £25,000 has been given to charity. The current total raised for the 2018 Lunge is £3,400 for Shelterbox and at least £850 raised by individuals for their own charities. Thanks to Heidi Warr for the £75 raised through sponsorship in THE LYME LUNGE. This arrived after our cheque had been presented to Shelterbox, but we have now posted a further £75 to the charity. Well Done!! See you next year?? An annual event held in the Alexandra Hotel Lyme Regis. 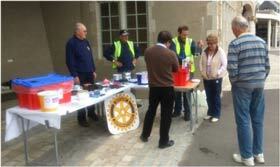 The Rotary Club of Lyme Regis are collecting old notes & coins, overseas coins, banknotes and other money for charity. There are collecting boxes in the Royal Lion Hotel Lyme Regis, Serendip Bookshop, Martin Diplock Estate Agents and Fortnam, Smith & Banwell Estate agents in Charmouth. So have a look at the back of the drawer or old an old sock where you put last year’s foreign currency that you will never use again as the Club can recycle it including out of date currencies which the Club can sell on ebay. To date they have raised almost £1000.00 for good causes. Have you any old used ink jet cartridges laying about? Well the RC of Lyme Regis have made arrangements with Serendip Bookshop, Broad Street in Lyme Regis to have a collection point for them. The cartridges that can be recycled include those made by HP, Dell, Lexmark, Canon, Samsung, Epson, Kodak and Neopost. Cartridges that cannot be recycled are damaged ones, refilled or other brands like Tesco, Think, PC World or Office Depot. Labels that have been removed or extra holes indicating refilling has been attempted. A little less to go into landfill, it all helps. The RC of Lyme Regis held a street collection in aid of the flood victims in Southern Africa in Lyme and Charmouth last Saturday and along with a collection made at our President's Night on Friday the sum of £1041.77. was raised. This will be sent to the Water Survival Box Charity and will enable them to send seven boxes to the stricken area giving clean fresh drinking water to seven families for over a year. Also in the box are necessary tools for basic survival. Arrangements have been made for the Club to recycle ink jet cartridges. A collection box has been left in Serendip and Rotarians / members of the public are invited to deposit their used cartridges in this box. The cartridges that can be recycled include those made by HP, Dell, Lexmark, Canon, Samsung and Neopost. Epson or Kodak cartridges can also be recycled via this collection box but see the further reference to these makes below. The Club has also been sent some prepaid envelopes that will enable Rotarians to send cartridges for recycling from the comfort of their own homes. BUT PLEASE NOTE that Epson and Kodak cartridges should not be sent in these envelopes since their value does not cover the postage costs. They can only be recycled using the collection box at Serendip. Mark is Rotary’s resident petrol-head. With a passion for motorsport, Mark’s dreams came true when he took part in the Caterham Academy 2017 season. While tearing around the track, Mark has donned Purple4Polio branding over his car and has collected donations at race days, all while promoting Rotary’s efforts to spectators and other drivers. His speed machine has also been a terrific attraction at Rotary’s World Polio Day event at the Queen Elizabeth Olympic Park in London in 2017 and the Rotary Conference in Torquay in 2018. Although a crash in the penultimate race of 2018 put an early end to his racing last year, Mark has his sights firmly set on hitting the track again in 2019." On the 4th February this year the Club held it’s annual Charity Soup & Ploughman’s Lunch at the Alexandra Hotel. This year a sell-out with several people on the waiting list for tickets, so 120 sat down to an excellent lunch using both the hotel dining room and the new orangery. The net proceeds including an excellent raffle will be £1530.00. a record sum for the event. The Rotary Club of Lyme Regis would like to place on record it’s grateful thanks to the Alexandra Hotel and it’s staff for providing a lovely lunch in such a wonderful setting and for donating the cost of the lunch to enable such a large sum to be raised. The charity this year was a Rotary founded Water Survival Box. This is a plastic box containing some of the necessities of life if you have lost everything in a natural disaster. The best part of this is a British made small hand operated pump (aquafilter) to give clean, virus free fresh water. This is enabled by a very fine micro-pores filter that blocks all bacteria and viruses but allows clean water to pass through. The recipient family empties the box of it’s contents and fills it with what is likely to be contaminated water, attaches the pump to side of the box and pumps away, out comes clean drinking water so helping to protect against water borne disease. 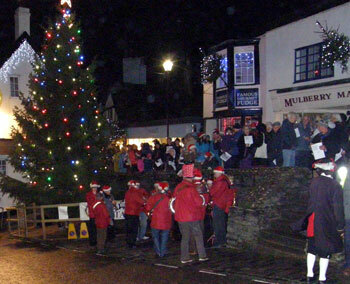 It was estimated that between 400 and 500 attended the Carols Round the Tree this year on a fine clear evening. With the road closure the crowd were able to get closer to the Lyme Regis Town Band and it made for more intimate event. Hot soup and mince pies were supplied free of charge by the Royal Lion Hotel, Alan Vian the Lyme Regis Town Crier was the MC and music was supplied by the Lyme Regis Town Band. A collection was made during the evening and along with the street collections from Lyme and Charmouth just over £1400.00. will be sent to Julia's House Children's Hospice in Bournemouth. Rotary would like to extend grateful thanks to all who the evening a success. The Rotary Club of Lyme Regis has distributed the funds collected at the August 2018 Candles on the Cobb. 50% of the monies was destined to the Royal British Legion, commemorating the centenary of the ending of the First World War, and we previously reported on £5000 being presented to them. The Club asked local youth organisations to make representation for the remaining 50%, for support for projects or activities, from which the following have been accepted, with a total of £5050 being donated. The Quiz held on 12th October at the Uplyme Village Hall to raise funds for the Nepal School rebuilding project was attended by 60 people and raised the sum of £517.00. This is likely to be increased to £550.00. and sent to the RC of Yeovil who are managing the fund raising to gain the maximum grants available. The street collection recently held by the Lyme Club for Indonesia raised £500.00. each for Shelterbox and Water Survival. 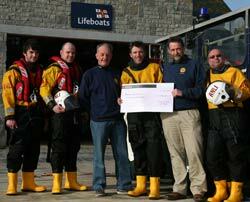 The money for Water Survival was increased to £1175.00. due to a matching grant via “The Big Give” and gift aid. This means we were able to fund three water survival kits. The Rotary Club of Lyme Regis held street collections in Lyme Regis and Charmouth on Friday 5th October for the victims of the Indonesia earthquake. A total of £864.07 was collected, Charmouth coming in with £461.60. and Lyme Regis with £402.47. The Club would like to thank all who generously supported our collection. This has been rounded up to £1000.00. by the Club and £500.00. has already be sent to each of Shelterbox and Water Survival. Both of these are Rotary organised charities. 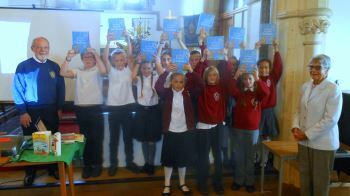 The Rotary Club of Lyme Regis continued with it’s ninth year of distributing illustrated dictionaries to local schools. This year 87 of the dictionaries were distributed to four primary schools in the area, Marshwood, Charmouth, Uplyme and Lyme Regis. At each school pupils in year 6 were handed their own individually named book by a Club member. Quoted one teacher at Mrs Ethelston’s School in Uplyme, “this is the 3rd year I have been involved with this wonderful project and the children really appreciate these books”. Attached picture show Rotarian Chris Buckingham handing out the dictionaries at Marshwood Primary School, pictured on the right is Pam Moseley who hand wrote each individual name inside the books. 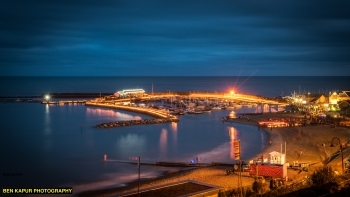 The Rotary Club of Lyme Regis is inviting youth organisations in the Uplyme, Lyme Regis and Charmouth areas to apply for a cash grant from the proceeds of the Candles on the Cobb money. Priority will be given to specific projects. In the first instance please apply to Richard Cridge on richard.cridge@sky.com stating briefly what the money might be used for. ‘If you are interested in finding out more about Rotary see www.lymeregisrotary.org’ or find us on Facebook. The 2018 Candles on the Cobb raised the grand total of just over £9700.00. Club President Peter Fortnam “Praised the Club, helpers and sponsors for this magnificent total raised in spite of all the weather could throw at us right up to the last minute. Special thanks must go to Alan Vian for his outstanding commentary and help all through the run up to the event”. This money will be shared between Local Youth Charities and the Royal British Legion remembering that WWI ended 100 years ago in 2018 and to this end the Royal British Legion will be one of the beneficiaries of the funds raised from the event. Candles on the Cobb at Lyme Regis was a spectacular success on Sunday 26th August. Not put off by heavy rain and strong winds during the day the organisers, The Rotary Club of Lyme Regis, held faith in the weather forecast and it paid off. 8 pm came, no wind, no rain! There was an added poignancy to the event with a commemoration of 100 years since the ending of WWI and an addition of a beautiful candle poppy on the beach, constructed by the Royal British Legion. “We weren’t able to put candles on the top wall,” said Peter Fortnam, Rotary Club President. “The huge swell added to the high tide meant that the waves were coming over the top in places and so the safety of some of our 150 lighters would have been compromised. However, we did put an additional row of candles on the lower level and relayed that over the loud speakers prior to the event. We did the best we could in difficult circumstances, thanks to up to 250 people who helped sponsor, organise and run the event. Wow! 250 volunteers from a town the size of Lyme Regis, what community spirit! It was a beautiful sight and the period of silent reflection once all the candles had been lit was very emotional indeed, once again surely one of the south west’s most spectacular and moving events. Its not just pounds sterling that can ‘Make a Difference': If you have ANY foreign currency, whether it be notes or coins, whatever country, even if now ‘out of date’, then The Rotary Club of Lyme Regis would be delighted to receive it and turn it into worthwhile aid to those in need. As well as Euros, we can use pre-Euro currencies such as French Francs, Italian Lire or Spanish Pesetas. We can use Tunisian Dinars, Egyptian Pounds, US Dollars, nickels or dimes. Or maybe you have some dhirams or rials lurking in a drawer from a holiday 10 years ago, clear them out and give them to us, we will make them work. ….and as for all that old sterling currency you have lying around, well, we can extract value from pre-decimal UK coins and notes as well as out of date decimal coinage and £5 notes. Please hand them into the Royal Lion Hotel; Serendip Books; Fortnam, Smith and Banwell, Estate Agents; Martin Diplock, Estate Agents; Guy Hayden Opticians, all in Broad Street: the Rotary Wishing Wall on Marine Parade in Lyme Regis, Also the Royal Oak and Fortnam, Smith and Banwell in Charmouth, or to any Rotarian. Now’s the time for a real clear out of that old foreign travel cash lurking in the sock drawer, so get after it and let us convert your unwanted overseas currency into valuable overseas aid for those in real need. taking up the organisation and running of “Candles on the Cobb”, the dramatic and spectacular event which was the dream child of local men Mike Higgs and Phil Street and which has done so much both to raise the profile of the town and to benefit the community. Rotarian Peter Fortnam will lead the organising team and will be President of the Rotary Club next year. “The focus of our effort will be to continue the tradition established by the original committee of helping local youth and other charities, as well as Rotary charities. We will also be remembering that WWI ended 100 years ago in 2018 and to this end the Royal British Legion will be one of the beneficiaries of the funds raised from the event. It will be a hard act to follow, but we will rise to the challenge and ensure that the spirit of the original ‘Candles’ is not extinguished but shines on. The school will be a two storey building constructed to exacting earthquake resistant standards, and will have 6 classrooms, toilet facilities and a perimeter fence. Additional support is to be provided in the form of furniture and some equipment and provision is being made to fund an English teacher for 4 years. We are delighted to be able to help Yeovil Rotary achieve their goal. Education is a key focus of Rotary International and is fundamental to building a sustainable community and promoting world peace. This £400 was raised through our “Foreign and Old UK Notes and Coins” initiative, which we are continuing throughout the summer season. Collection boxes are available in Martin Diplock, Serendip, Royal Lion, Fortnam, Smith and Banwell, Guy Hayden Opticians and Your World Travel in Lyme Regis and in Fortnam, Smith and Banwell, and The Royal Oak in Charmouth. Any coins or notes, UK or foreign, current or out of date, will be gratefully received. Help us to help the children of earthquake ravaged Nepal. 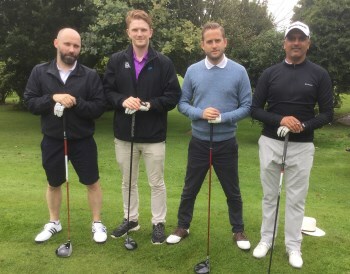 The format was Stableford, with 23 teams each of 4 golfers and excellent prizes awarded to teams with the highest joint scores. A team headed up by Lyme Regis stalwart Jim Moseley with Douglas Moseley, Neil and Sarah Hampton-Rumbold took first prize with 91 points. The Rotary Clubs of Lyme Regis and Axminster would like to thank the Lyme Regis Golf Club for the huge assistance they gave us in running the event on their excellent golf course. As usual they did a great job for us, many of those who played have come year after year and remarked, yet again, on how well the course was prepared and what a great reception they had been given. Rotary has had several collection boxes in businesses in Lyme and Charmouth for a couple of months, collecting foreign notes and coins, old UK notes and coins, in fact any money that you might find down the back of the sofa or in the sock drawer, whether current or out of circulation. So far, thanks to your generosity, we have converted your donations into £400 sterling, through a process of sales on Ebay, deposits in the bank and sales of bulk coins by weight. We are continuing with our collection thanks to the generosity of Serendip, Broad Street; Martin Diplock, Broad Street; Royal Lion, Broad Street; Fortnam Smith and Banwell, Broad Street; Guy Hayden, Broad Street and Your World Travel, Bridge Street; the Rotary 'Jurassic' Wishing Wall, Marine Parade, all in Lyme Regis and Fortnam Smith and Banwell and the Royal Oak in Charmouth. Please think of us when you are clearing out your drawers & when you come back from holidays: we can make every penny of that spare money work for good causes. The Rotary Club of Lyme Regis’s annual Soup and Ploughman's at the Alexandra Hotel, Lyme Regis, raised £1000 for this year’s beneficiary, the Somerset based disaster relief charity, Water Survival Box, which is run by Rotary. Rotarian Richard Finch, who has organised the event for many years, thanked everyone for their support. “This popular event has been run by Rotary annually over more than 20 years in the Alexandra Hotel,” said Richard. “Thanks to ‘The Alex’ for providing the venue and for your tremendous support for Rotary. Thanks also, to everyone who came along and supported us, for your generosity.” Our chosen charity, Water Survival Box, which we have supported several times in the past, has helped families overcome by disaster - earthquake, hurricane, floods, war - in many countries in the past year, including Argentina, Chile, Syria, several Caribbean islands. A box costs £150 to fill and send to anywhere in the world, on demand. It provides a filter pack for clean water, the means to cook and eat, health and hygiene items and basic shelter and tools. The event was attended by the Mayor of Lyme Regis, Councillor Michaela Ellis and her husband, Alan, and by Rotarian Ken Biggs and wife Jenny from Water Survival Box. The final figure of £3,400.00. collected in sponsorship and the beach collection from the Lyme Lunge 2018 has now been delivered by the Lunge organiser, Rotarian Jim Moseley, to the Shelterbox HQ in Truro. The Shelterbox World HQ in Truro is an 18 months old purpose built building housing all the admin, accounting, fund raising & purchasing staff. There is now a new visitor centre there open to all 10.00.am to 4.00.pm, stocked with static displays of both the winter and summer tents along with a special children’s corner. There is also a long counter where visitors can get hands on filling a Shelterbox for real. The main depot where the boxes are filled and distributed is still at a premises near Helston where one full time person runs the operation and all the boxes are still filled by voluntary labour. Jim Moseley, Lunge organizer. Picture shows Rtn Jim Moseley handing over the cheque to Andrew Bramwell, manager of the Visitor Centre with Alison O’Donell from the fund raising office. We are pleased to welcome Michael Taylor to the Rotary Club of Lyme Regis. A past member of Royston Rotary Club since 1999 Michael has recently moved into the area and is living in Catherston Lewiston with Partner Ruth Cubitt. He transferred to the Rotary Club of Lyme Regis on January 16th 2018. Following National Service with the RAF Michael joined a company which sold business machines, many to the retail industry, but as the nature of shopping changed to self service he saw an opportunity and set up his own shop fitting business which he successfully ran for many years. 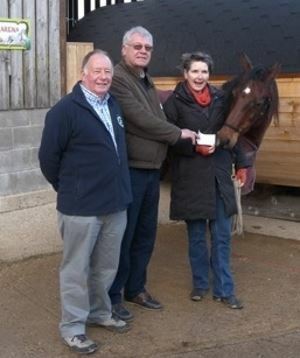 The Rotary Club of Lyme Regis was pleased to present Dorset based charity The HorseCourse with a cheque for £1250, the result of our Christmas Collection. 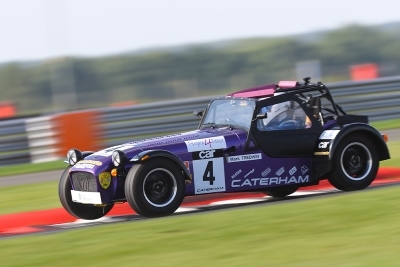 Rotarian Mark Tredwin fundraised throughout the last year as he took part in the Caterham Academy racing 'school' . We are delighted to announce that as a result of this effort, and a contribution from monies left in our box in front of the splendid Christmas Tree on display at the Lyme Regis Christmas Tree Festival, we have been able to present Julia's House, the Dorset Children's Hospice, with a cheque for £300 AND to boost the coffers of the Rotary Purple for Polio appeal by a similar amount. Well Done Mark, and thanks to all who contributed to help us raise this amount. The Purple4Polio funds will be matched by the Bill and Melinda Gates Foundation. 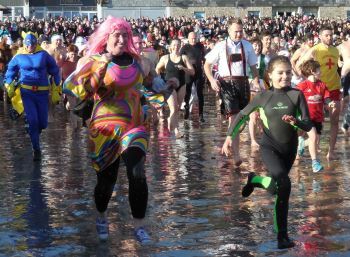 Positively tropical weather in Lyme Regis on New Year’s Day 2018 as the 10th annual Lyme Lunge attracted an estimated 2500 spectators to an event which is fast becoming a ‘must do’ New Year's Day event on Dorset’s South Coast. Upwards of 600 crazy swimmers in fancy dress laughed and squealed as they raced under blue skies into the sea, ably protected by our indomitable Lyme Regis Lifeboat Crew, with St John’s Ambulance standing by in case of injury. 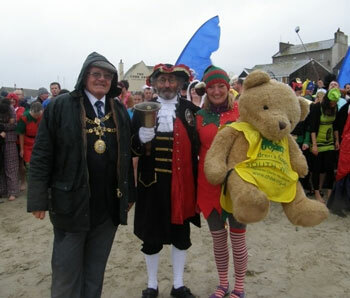 Organised by the Rotary Club of Lyme Regis, THE LYME LUNGE took place on the sandy beach, Lyme Regis, at 1.00pm on New Year’s Day. 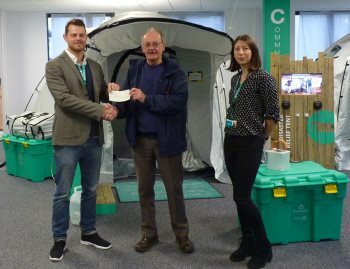 This year our main charity is Shelterbox, the Cornwall based disaster relief charity founded by Rotary which does so much good work around the world. Well done everyone involved, it was such a happy family event in brilliant sunshine, just the tonic for bringing in the New Year. Thanks to our sponsors for their support (see our website for details), The Harbour Inn, Lyme Regis for tasty hot soup for all swimmers, Town Crier for immense help and for leading the Parade, Lifeboat Crew for safety in the water, Lyme Regis Sailing Club, St John’s Ambulance, Axminster Rotary Club, and friends of Rotary who also helped enormously. Its great fun, it supports the whole community and it helps a great cause. We would also like to thank the Lyme Regis Fudge Kitchen and the Bell Cliff cafe in Broad Street and Morgans in Charmouth for offering regular hot drinks to our cold collectors, much appreciated. One of the aims of the Rotary Club of Lyme Regis is to improve literacy among our young people. “Because everything changes when we read,” says The Reading Agency, a national body whose aim is to make reading more accessible to people of all ages. So, when the Lyme Regis Library contacted us and asked us if we would like to support their Summer Reading Challenge to the children in local schools there was no hesitation. The Summer Reading Challenge encourages children aged 4 to 11 to read six books during the long summer holiday. The theme changes each year, with the theme for the 2017 Summer Reading Challenge being Animal Agents, illustrated by the UK's best-selling children's illustrator Tony Ross. A number of primary schools in the Lyme Regis area took part, with Rotary providing the incentive of a prize of £50 to the school where the most books are read per pupil. The Rotary Club of Lyme Regis quickly rose to the challenge set by the destructive hurricanes that have swept through the Eastern and Northern Caribbean in the last week by collecting in Lyme Regis and Charmouth on Saturday 9th Sept. Thanks to the generosity of the people of both these towns, and visitors, a total of £623 was raised. The disaster relief charity ShelterBox, based in Cornwall and founded by Rotary and which is already directing aid where most needed, will immediately benefit from your generosity. Over the past week the Rotary Club of Lyme Regis has again presented personalized copies of Usborne Illustrated Dictionaries to Year 6 pupils in schools in the Lyme Regis area, namely St. Michaels, Marshwood, Mrs Ethelstone’s and Charmouth Primaries. 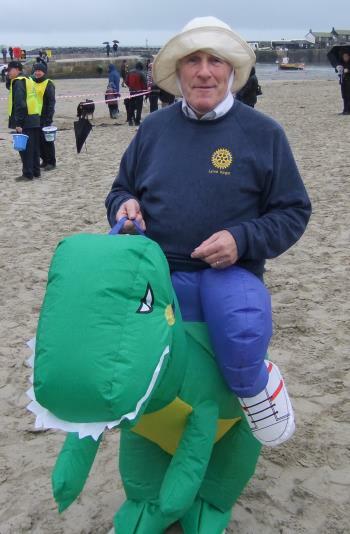 “Promoting literacy is a major objective of Rotary,” said Lyme Regis Rotary President Les Baker. “Literacy is so important to successful educational development, even in today’s digital world. It is fundamental to effective communication and understanding. A strong command of our language, underpinned by a good dictionary, will open up new worlds for our children as they explore books and find the magic worlds within them and will also make them more competitive in today’s jobs’ market. We are really pleased at this opportunity to help the young of our community. For more information about the Cancer Appeal, and to donate to help build this potentially life changing facility, please visit www.dchft.nhs.uk/charity. or contact the Charity on 01305 253215. The Rotary Club of Lyme Regis has donated £1000 towards the Dorset County Hospital (DCH) Cancer Appeal, which is now heading towards £1.1 million with a target of £1.75 million. The Appeal is funding a Cancer Outpatients Department which is being built on top of the new Robert White Radiotherapy Unit currently under construction at the Hospital. Past President of the Lyme Regis Rotary Club, John Bartlett said, as he presented the cheque to Simon Pearson, Head of Fundraising at DCH’s Charity, “We were motivated by your presentation to our Club last month in which you showed us the major benefits such a facility will bring to the people of West Dorset, and we will do everything we can to widen knowledge of this Appeal.” “We need to maintain the momentum of the Cancer Appeal,” replied Simon, “ and keep this important project in the public eye. Donations from clubs and organisations such as Lyme Regis Rotary Club are hugely important and very much appreciated.” For more information about the Cancer Appeal please visit www.dchft.nhs.uk/charity. The Cancer Appeal is part of a major project bringing radiotherapy services to Dorchester for the first time. The £9.15 million partnership with Poole Hospital became possible largely thanks to a generous donation from Poole businessman Robert White. Other major donors include the Fortuneswell Cancer Trust, the Lawrence Werth Trust, Garfield Weston Foundation, Ducks and Drakes Cancer Trust and the Kay Kendall Leukaemia Fund. Fundraising for the Appeal continues as hospital staff, local people and community groups organise a wide variety of events, challenges and activities. An easy way to help is to support the Charity’s Buy a Brick campaign - just text DCHC44 £2 (or more) to 70070. 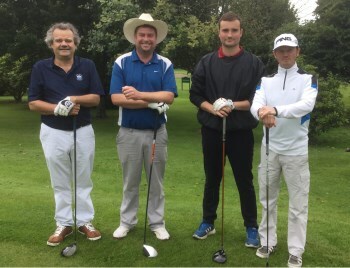 The 11th Annual Charity Golf Day, run jointly by the Rotary Clubs of Lyme Regis and Axminster at the Lyme Regis Golf Club on Wednesday 10th May, was a resounding success, with about £4000 raised for local charities. This brings to around £40,000 the amount raised to date by what is now a well established and successful event. “Thanks to our sponsors this event has gone from strength to strength,” said Lyme Regis Rotarian Richard Cridge who helped organise it. “Without them it would not have been the success it is. This year we are donating half of the proceeds to two splendid charities, namely JULIA’S HOUSE (The Dorset Children’s Hospice) and ELF (Exeter Leukemia Fund). The remainder will be distributed to other Lyme Regis and Axminster local charities and organisations. We sincerely appreciate the support of our main sponsor, Axminster Re-Cycling, major sponsor Axminster Tools and to the 30 plus other local organisations that helped sponsor the event or donated major prizes for the raffle and silent auction. A full list of sponsors can be found on our website www.lymeregisrotary.org.” The format was Stableford, with 22 teams each of 4 golfers and excellent prizes awarded to teams with the highest joint scores. A team from Yeovil Rotary Clubs (Dennis Stevens, Bruce Bailey, Peter Clarke and Paul Hillard) took first prize with 94 points. The Rotary Clubs of Lyme Regis and Axminster would like to thank the Lyme Regis Golf Club for the huge assistance they gave us in running the event on their excellent golf course. As usual they did a great job for us, many of those who played remarked on how well the course was prepared. Photo: Axminster Rotary President John Foulkes (left), accompanied by Lyme Regis Rotary President David Sarson (right) congratulates the winning team from Yeovil Rotary on achieving first prize. It was generally agreed that the Rotary quiz on Saturday 25th in Uplyme Village Hall was a most enjoyable event, raising over £850 towards the Rotary Dictionary Fund which provides Usborne Illustrated Dictionaries to Year 6 pupils in four local schools each year. Quizmaster Jim Moseley flummoxed the 100 quiz devotees once again with his questions, while Pam Moseley acted as chief scorer and ensured no cheating took place - would it ever, it's Rotary??! Thanks from Rotary to all who took part and made it such a great evening and helped us raise these funds. The Dictionary programme has been running now for about 8 years and with the help of projects like this we hope to continue it for many years to come, benefiting local schoolchildren. In the summer and autumn of 2016 the Rotary Club of Lyme Regis ran a ‘Selfie Cow’ competition. We encouraged people to purchase a little plastic cow, and take photographs of it in all sorts of locations and post these on a dedicated FaceBook site, with prizes offered in three categories.. Besides being a great deal of fun, with several hundred amusing photographs from around Lyme and around the world we raised £500 for the international charity Lend with Care. The monies are credited to an account within the Lend With Care charity’s structure, allowing the charity to keep a close record of the results of our “Loan”. The charity then uses funds from that account to support successful applications for loans from qualifying startup businesses in third world countries. In this way our £500 is spread around a number of projects, along with many other donations, thus spreading the risk of failure to repay. Over specified periods the monies are repaid, then can be loaned out again. So far our monies have resulted in 16 loans (£445), 137 entrepreneurs helped, 443 family members helped and an estimated 134 jobs created. Thanks to all whose participation in this fun project made it a great success, helping others to help themselves and grow out of poverty. Photo: Quang Thi Hien - Vietnam Animal Rearing - £15.00; One of the recipients of our ‘Selfie Cow loan. The Rotary Club of Lyme Regis held its annual Soup and Ploughmans at the Alexandra Hotel, Lyme Regis, on Monday 6th February. Attended by over 100 people, the event was a great success with over £1000 raised for this year’s beneficiary, the Dorset based hospice, Weldmar. 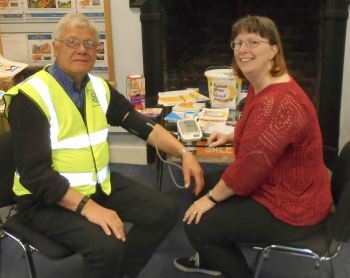 The event was attended by the Deputy Mayor of Lyme Regis, Councillor Michaela Ellis and her husband, David, and by Diane Bentley from the Weldmar Hospice. Rotary Christmas Fundraising Presented to Make-a-Wish charity. 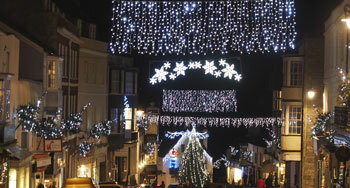 The Rotary Club of Lyme Regis has presented the children’s charity Make-a-Wish with a cheque for £1400, being the sum collected over the Christmas period, including the popular Carols Round the Tree in Broad Street. Make-a-Wish charity exists to grant wishes to enrich the lives of children fighting life-threatening conditions, providing respite from the daily struggles that come with these. Harry, who has a rare bone cancer and underwent 7 months of chemotherapy, a course of intravenous immunotherapy and a major operation was granted his wish to cycle at the London Velodrome. Oscar was diagnosed with a type of blood cancer called Juvenile Myelomocytic Leukaemia. He endured over 100 blood transfusions, it was also found he had tumours on his brain, but he never once cried. Make-a-Wish brought some happiness to his short and painful life by arranging for Oscar to meet his favourite football team, Chelsea, and spend time with them as an honoured guest at a top Premiership game. 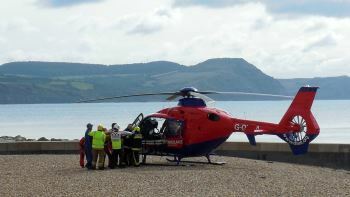 Such wishes bring some light into what are otherwise painful and difficult lives, and the generosity of the people of Lyme Regis and Charmouth in helping us raise such funds is very much appreciated. Our thanks to everyone who donated. Really awful weather again on New Year’s Day 2017 but it takes a lot to discourage intrepid Lyme Lungers. 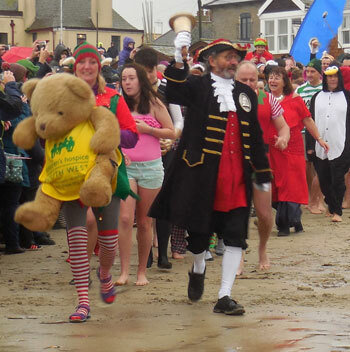 An estimated 1200 spectators watched in the cold rain as nearly 600 crazy swimmers in fancy dress laughed and squealed as they raced into the waves, ably protected from harming themselves in the stormy waters by our indomitable Lifeboat Crew. 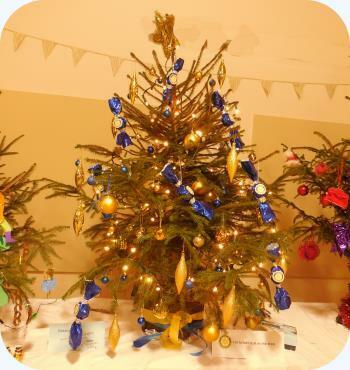 The Rotary Club of Lyme Regis’s Christmas collection was for Make-a-Wish, a charity that offers support to terminally ill children. We collected in Broad Street, Lyme Regis, and in Charmouth, and at the annual Carols Round the Tree in Broad Street on the 23rd Dec. Our total collection this year was £1300. Many thanks to all who made this year’s appeal a great success. A number of establishments provided our cold and damp collectors with copious mugs of much appreciated coffee and Fortnam, Smith and Banwell again gave us an operations base. At “The Carols” The Royal Lion generously donated very tasty hot soup and mince pies to participants, The Town Band played superbly, as always, the Town Crier announced the carols in his usual enthusiastic and professional manner. Our thanks to them all, and also to the Mayor of Lyme Regis, Councillor Owen Lovell, for attending with his wife Christine. A great Community event indeed. "This article (above) appeared in the 'View from Lyme Regis', our local paper which does so much to promote Rotary activities, as well as many other charities in the town. We are humbled to read the article, written by the Managing Director Philip Evans who himself does sterling charitable work in the town. Thank you, Philip, much appreciated." The Rotary Club of Lyme Regis collected £600 in Lyme Regis and Charmouth on Saturday, for the Rotary charity Water Survival Box and the benefit of the victims of the recent Haiti Hurricane Disaster. Thanks to residents of both communities who gave so generously. These monies will buy four boxes, helping alleviate the suffering of four families by providing clean water and improving their health and welfare. 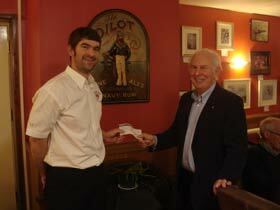 The Rotary Club of Lyme Regis has donated £255 to the RAF Benevolent Fund. These monies were raised at our stall on RED ARROWS DAY, July 21st, when we ran a raffle at which the two prizes were a unique glass plaque of a Spitfire aeroplane made by Rotarian Guy Hayden and his wife Jane, and a print of the Battle of Britain Memorial Flight signed by the 2016 display team. The Rotary Club of Lyme Regis ran a very successful stall on Red Arrows Day, July 21st, raising a total of over £940 for various charities and good c auses, including the Red Arrows Fund. Rotary’s Water Survival Box, The RAF Benevolent Fund, Lend With Care and Rotary Foundation’s Purple4Polio all benefited from the generosity of the many people who visited our stall on that day. In addition, Rotary provided 17 Collectors and Marshals for the visit of The Red Arrows. If you want to find out more about Rotary visit our website at www.lymeregisrotary.org or see us on Facebook. At Last! After the weather induced cancellation in May our Annual Golf Day took place on a magnificently manicured Lyme Regis Golf Course. 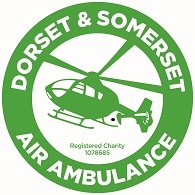 Run in conjunction with the R otary Club of Axminster we are raising monies for the Dorset & Somerset Air Ambulance and the Devon Air Ambulance and other local charities. Thanks to all our sponsors who stuck with us through the cancellation, to the Lyme Regis Golf Club and its catering staff, and of course to all who played. 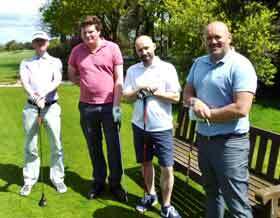 The winners on the Golf Day were as follows: 1st with 90 points. Roger Pincombe, Chris Brewer, John Birch & Paul Galloway (Local team): 2nd with 85 points. Kevin Unwin, Colin Tinder, Lee Yearly & Paul Courts (Local team): 3rd (on count back) with 82 points Bernie Styles, Nigel Garwood, Ashly Colman & Richard Oarsman (Local team): 4th with 82 points Brian Smith, Roy Bartlett Derrick Singleton & Martin Hanlon (Paignton) Longest drive men on the 7th. Jedd Whittington. Longest drive ladies on the 6th. Jo Lloyd Davies. Nearest the pin men on the 11th. Paul Galloway Nearest the pin ladies on the 8th. No winner Nearest the pin in 2 - men on the 17th. Ratnesh (Mark Hix team) nearest the pin in 2 - ladies on the 18th. Anne Blackler. The Annual ‘EXMOOR CHALLENGE’ between two Rotary Districts is a 5 - 10 mile walk (some say ‘gentle’, others ‘rigorous’) over Exmoor’s lovely National Park, and the District with the most walkers takes the trophy home. We all hope the memories of the day will be of spring sunshine, bluebells and primroses, dancing lambs and singing blackbirds, but for some it is aching legs and blistered feet. This year 17 Lyme Regis Rotarians, friends and partners shrugged off the winter blues and strolled purposefully with the other 116 entrants over the moors to help District 1200 bring back the trophy once again. Various fisherman’s tales of the length of the walks we're met with the usual “Oh, Yeah?” by those who stayed at home, but even if it wasn’t the “7 - and a (big) bit more ” or “12 and a bit, at least” miles they claimed they had walked, we were impressed, or at least tried to give the impression we were). WELL DONE, Guy, Les & Dawn, Richard & Pam, Bill & Margaret, Eddie & Olwen, Peter & Sue, Jim & Pam, Bill & Caroline, Peter & Lynne. Entry fees were £7, some walkers got sponsorship, all profits to the Children’s Hospice South West, represented by Paula Garrett (of Lyme Lunge fame) who herself took part in the walk. 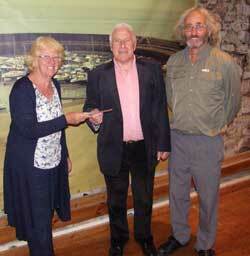 The Rotary Club of Lyme Regis has donated £1000 to Dementia UK. “We raised these monies at our annual Quiz Night in March,” said Rotary Secretary Bill Taylor, who has run this successful event for the past 7 years. “There has been a lot of talk in the national press these last few years of the increase in this debilitating condition. Most people have a close friend or relative who have been or are affected either directly or indirectly, and there is currently no cure for it. Dementia UK does great work providing one-to-one support not only to people with dementia but also to their families. The condition affects all aspects of life for a family afflicted by dementia. By providing compassionate trained support and guidance the charity helps families to live more positively with dementia in the present, and face the challenges of tomorrow with more confidence and less fear. 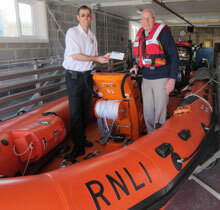 The Rotary Club of Lyme Regis has donated £500 to Autism Wessex. Autism Wessex is a regional charity providing specialist services for people affected by autism and associated difficulties across Dorset, Somerset, Hampshire and Wiltshire. Help is varied and far reaching, including education, residential, respite and social care, advocacy and advice services. The Rotary Club of Lyme Regis has donated £4500 to The Children’s Hospice South West (CHSW), being proceeds of THE LYME LUNGE, held on January 1st 2016. The Rotary Club of Lyme Regis last week presented a cheque for £1350 to Julia’s House, the Dorset Children’s Hospice, monies that were the proceeds of a Christmas Collection in Lyme Regis and Charmouth, including Carols Round the Christmas Tree. 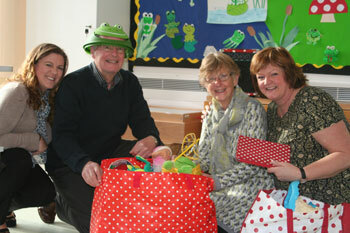 PIC: John & Jenny McCallum (centre) get stuck into the Red Dot Bag with Stacey and Sue at Julia’s House. Storm Frank and its follower squalls did their best to spoil our fun but it takes a lot to dampen the spirit of Lyme Regis. All the town car parks were full by 11.45 as people hurried to catch the Duck Race then round to THE LUNGE. 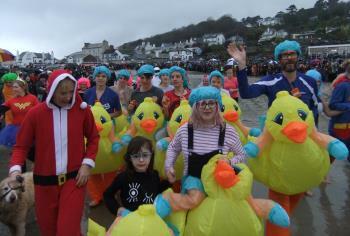 An estimated 1500 spectators watched as nearly 400 crazy swimmers in fancy dress laughed and squealed as they raced into the waves, ably protected from harming themselves in the stormy waters by our indomitable Lifeboat Crew. By 1.20pm the beach was clear again, just as if nothing had taken place here. But it had. We have raised over £2500 to date with an expectation of considerable additional monies coming in from promised sponsorship and Rotary match funding. Well done everyone involved. Thanks to our sponsors for their support (see our website and Facebook for details), By the Bay for tasty hot soup for all swimmers, Town Crier for immense help and for leading the Parade, Lifeboat Crew for safety in the water, St John’s Ambulance, Axminster Rotary Club, The Mayor of Lyme Regis, Councillor Owen Lovell (who hastily turned down a late invitation to LUNGE! ), friends of Rotary who also helped enormously. Particular thanks to Rotarian Jim Moseley whose organisation of the event once again proved excellent. No fuss, it just happens, its great fun, it supports the whole community and it helps a great cause. Funds raised from THE LYME LUNGE for various charities have so far reached almost £5400. This includes a fantastic £1000 donation by a family from Essex and £150 from Lyme Bay Dentistry (the tooth fairies!!!?) plus several other great donations. The Essex family raised a further £1300 for McMillan Nurses, the Dentists another £100 through a Just Giving site, and over £200 raised so far by ‘Anna and Jackie’ for the Pelican cancer charity. 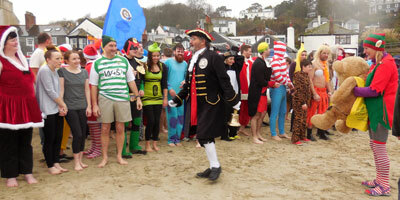 “Well done, everyone,” said Rotarian Jim Moseley, organizer of the event for the Rotary Club of Lyme Regis. “So many very generous people helping us support Children's Hospice South West which is this year's chosen charity, and other charities, too. This was a superb, fun filled event with many of our community taking part. These monies will go towards supporting many very ill children and their families through the work of the Hospice. Thanks, and keep it coming!! 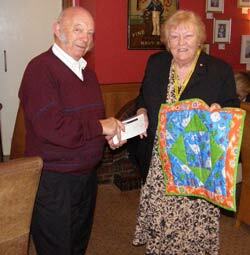 The Rotary Club of Lyme Regis’s Christmas collection was for Julia’s House, the Dorset Children’s Hospice. We collected in Broad Street, Lyme Regis, and in Charmouth, and at the Carols Round the Tree in Broad Street on the 23rd Dec. Our total collection this year was £1307. We would like to thank The Fudge Kitchen for kindly providing our cold and damp collectors with copious mugs of superb coffee and Fortnam, Smith and Banwell for giving us an operations base. At “The Carols” The Royal Lion and The Pilot Boat generously donated hot soup and mince pies, The Town Band played superbly, as always, the Town Crier announced the carols in his usual enthusiastic and professional manner and thanks also to the Deputy Mayor, Councillor Michaela Ellis, for attending with her husband Alan. A great Community event indeed. The Rotary Club of Lyme Regis has supported the work being led by Alan Vian, Lyme Regis popular Town Crier, in a remote Malawi village. Rotarian Lesley Stone generously made available the Monmouth Room at the Royal Lion Hotel for a Cheese and Wine tasting evening. The celebrated local cheesemonger, Justin Tunstall, and Andrew Martin from Matthew Clark wine merchants led some 40 Rotarians and Partners through a selection of their excellent produce. The Rotary Club of Lyme Regis today presented a cheque for £1000 to FORCE, the cancer charity (Friends of the Oncology and Radiotherapy Centre Exeter). These monies were raised at the Rotary Golf Day in May. FORCE was set up by two doctors from the Royal Devon and Exeter Hospital about 25 years ago. It comprises a modern purpose built centre, situated on the hospital site at the corner of Barrack Road, Exeter with a small peaceful garden. It's purpose is to give information, help, advice and therapies to patients and their families affected by any form of cancer. Advice such as getting benefits, insurance, mental health issues, respite during long term visiting, therapies such as aromatherapy, massage or reflexology. They also have group sessions, for example art, fashion evenings, help with wig fittings, beauty sessions, etc. Outreach centres staffed by two qualified nurses are set up in Tiverton and Okehampton, with plans for one in East Devon, possibly Honiton / Sidmouth, these are to administer chemotherapy for patients. There is also a programme of post treatment care and advice funded by the charity. The 9th Charity Golf Day, run jointly by the Rotary Clubs of Lyme Regis and Axminster at the Lyme Regis Golf Club on Tuesday 12th May, was a resounding success, with over £3800 raised for local charities. This brings to around £34,000 the amount raised to date by what is now a well established and successful event. “Thanks to our sponsors this event has gone from strength to strength,” said Lyme Regis Rotarian Richard Cridge who helped organize it, “without them it would not have been the success it is. This year we are donating half of the proceeds to two splendid charities which provide much needed support to local people in the fight against cancer, namely FORCE (Friends of the Oncology and Radiotherapy Centre Exeter) and ELF (Exeter Leukemia Fund). The remainder will be distributed to other Lyme Regis and Axminster local charities and organisations. We sincerely appreciate the support, yet again, of our main sponsor, Hix Oyster and Fish House in Lyme Regis, major sponsors Axminster Tools, Holmesley Nursing Home in Sidmouth and Bridec of Bridport, and to the 30 plus other local organisations that helped sponsor the event or donated major prizes for the raffle. The Rotary Clubs of Lyme Regis and Axminster would like to thank the Lyme Regis Golf Club for allowing us to run the event on their excellent golf course. As usual they did a great job for us, many of those who played remarked on how well prepared was the course, and the hospitality and catering were highly praised. Their track record in providing excellent weather is, as yet, untarnished. On Friday 20th March the Rotary Club of Lyme Regis conducted a collection in Broad Street, Lyme Regis, in aid of the victims of the terrible cyclone that destroyed much of the island country of Vanuatu in the Pacific Ocean about a week before. Few of us can appreciate the horror of 200 mph winds or the resultant destruction. 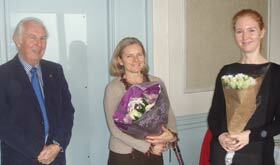 We were delighted to raise £310 from a generous Lyme Regis public. 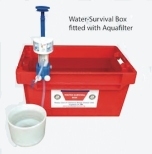 Funds will be sent immediately to Water Survival Box, the Somerset based disaster charity, which is sending both Water Survival Boxes, in response to reports of lack of drinking water, and specialist packages ‘School in a Bag’ for the children of Vanuatu who have lost everything. Thanks to all who donated to this collection on the day, but if you missed it and would like to contribute then perhaps you would consider sending a cheque, made payable to ‘The Rotary Club of Lyme Regis’, to Rotarian John McCallum, Langton, Colway Lane, Lyme Regis, DT7 3HE, and we will see that it is forwarded to WSB immediately. Why are we always blessed with wet and windy weather for the Lyme Lunge? 1st January 2015 was no exception even though the Christmas period was dry and sunny. Despite with the inclement weather conditions 320 ’crazy ‘lungers’ took part this year. Promptly at 1.00 pm the Parade of Swimmers took place showing off a variety of fancy dress costumes which were varied and quite imaginative. This year we were lucky to have a real bride and groom who were married the day before and brought their guests suitably adorned in wedding dresses. There was a great cheer went up from the onlookers who numbered in excess of 1000 and at the drop of the flag the swimmers rushed down to the sea for a very short dip. They were out in about 5 minutes and off to a very welcome cup of hot soup, courtesy of By the Bay Restaurant. We were fortunate this year to have had coverage from BBC Spotlight who featured the ‘Lunge’ in their evening local news slot. It was a tremendous success this year despite the weather and certainly will be remembered as The Formidable Lyme Lunge to commemorate of the sinking of HMS Formidable in Lyme Bay 100 years ago. 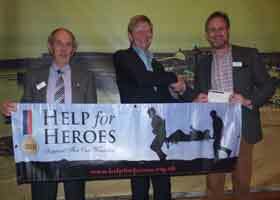 Over £4000 was raised for this year’s Charity ‘Help the Heroes’ with some sponsorship money still to come. The organisers, Lyme Regis Rotary Club would like to thank all the sponsors including some local businesses, the local RNLI crew, who seemed to enjoy their swim, the Mayor Sally Holman and Town Crier Alan Vian who acted as MC again, the St John Ambulance, By the Bay Restaurant for providing the hot soup, Pasty Presto for providing pasties for the helpers and finally Jim Moseley and all the Rotarians and volunteers without whose help the event would not have been so successful. Help for Heroes Regional Manager, Richard Lupton, along with local H4H representative Peter Lacy, was delighted to receive £4300 from the Rotary Club of Lyme Regis, funds raised at a very exciting Lyme Lunge on January 1st. In recognition of all the hard work put in by the RNLI crew at THE FORMIDABLE LYME LUNGE it was decided to donate £200 to the RNLI Lyme Regis Crew Fund. THE LYME LUNGE would not have gone ahead without the RNLI Crew to provide safety in the water. We trust the crew can positively utilise this small contribution!! Well Done, Lads, thanks from all of us at Rotary. 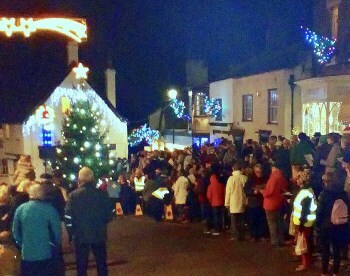 Thanks to some very good weather we were able to hold our annual Carols Round the Tree this year. 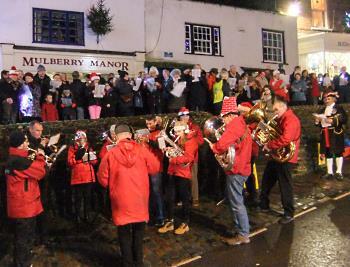 A large crowd of people enjoyed the carol singing and were accompanied as before by the Lyme Regis Town Band. Mince pies, hot chestnuts and soup was provided by the Rotary Club of Lyme Regis. We would like to thank the Royal Lion Hotel for providing the mince pies, The Pilot Boat Inn for the hot soup and chestnuts, the Lyme Regis Town Band, the Town Crier for acting as MC, the Mayor Sally Holman and of course the public for supporting the event so well. The event raised £650 and this together with the street collections in Lyme Regis and Charmouth before Christmas made a total of £1400 which will be donated to the Charity this year Children’s Hospice South West. We would like to thank you all for your generosity. 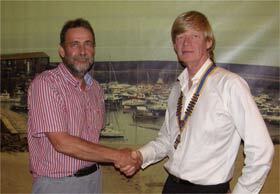 Lyme Regis Rotary Club has appointed a new President for Rotary Session 2014-15, which began on July 1st. Rotarian Guy Hayden, who runs Hayden’s Opticians in Broad Street, and who has held the post for the past year, handed over the reins to Rotarian Mark Tredwin, who is the Deputy Town Clerk. “Guy has given the Club great service over the past year,” said Mark as he accepted his Chain of Office. “His experience and energy have been invaluable in consolidating the changes led by his predecessors and in continuing to build the Club. A steady stream of visitors to the stall, all surprised by the magic of converting dirty water into clean drinkable water, tasting fresher than the stuff that comes out of the taps. That was the experience we had last weekend when the Rotary Club of Lyme Regis demonstrated the Aquafilter pump and the Water Survival Box in the Jubilee Shelters on Marine Parade. 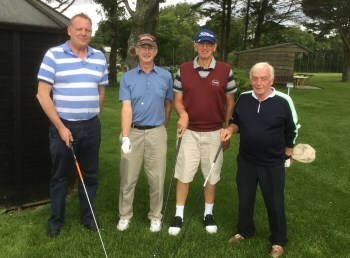 The 8th Charity Golf Day run jointly by the Rotary Clubs of Lyme Regis and Axminster at the Lyme Regis Golf Club on Tuesday 13th May was a resounding success, with £4,800 raised for local charities. This brings to around £30,000 the amount raised to date by what is now a well established and successful event. The Rotary Clubs of Lyme Regis and Axminster would like to thank the Lyme Regis Golf Club for allowing us to run the event on their excellent golf course. As usual they did a great job for us, many of those who played remarked on how well prepared was the course, and the hospitality and catering were, as usual, first class. Their track record in providing excellent weather is, as yet, untarnished. and Axminster (Bill Coltham) Rotary Clubs. 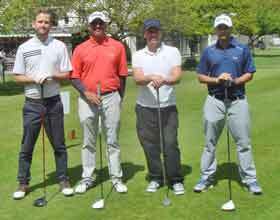 33 teams each of 4 golfers took part on a day of glorious sunshine. 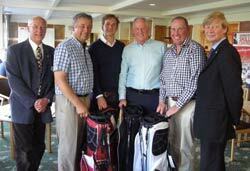 The format was Stableford with excellent prizes awarded to teams with the highest joint scores. A team from Axminster (I Rowland, A Thomas, P Alderson, W Russell) took first prize with 91 points. The Rotary Club of Lyme Regis has raised £1400 to purchase a specialist neonatal cot for Julia’s House, the Dorset children’s hospice. Julia’s House is the only children’s hospice charity in Dorset and is dedicated to helping life-limited children and their families across the county. “We asked the Hospice what equipment they needed and they suggested this specialised cot which costs £1400, so we resolved to raise the funds to buy it,” said Rotarian David Bettes, who organised the fund raising effort. “It was tough raising this level of funds alongside everything else we are doing, but not as tough as what these children and their families go through, and that was inspiration enough. They truly are a dedicated team at Julia’s House and we are very pleased to be able to help in this small way”. Also presented to Julia’s House was a beautiful quilt spe cially made by Denise Bartlett, wife of Rotarian John Bartlett, designed specially to fit the cot. It is made of cotton fabric with a bright cheerful, child oriented sea creature design (octopus, fish, whales, crabs etc.). The monies were raised by holding a Swing Band Night and obtaining matching funding from Rotary District 1200.
and Portland Friends of Julia’s House. 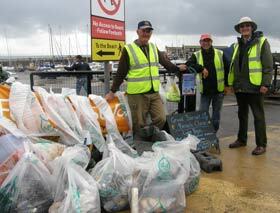 Lyme Regis Rotarians and Partners helped out in the annual Great Dorset Beach Clean on Sunday 27th April, collecting a huge amount of rubbish from Monmouth Beach on a cold and wet morning. Paper, plastic, shoes, cigarette lighters, rubber, fishing line, nylon netting, rope, an old bike, BBQ, glass, you name it, we found it on the beach. What a Dirty Lot we are! 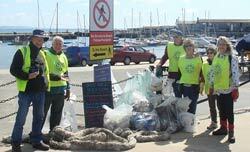 Many thanks to the Lyme Bay Sandwich Company and By the Bay Restaurant for free coffees and teas to all Litter Pickers. The Rotary Club of Lyme Regis held its popular Annual Charity Quiz Night in Wootton Fitzpaine Village Hall on Saturday 8th March. £860 was raised and will go towards providing clean water gathering facilities for the Nyakabaare Primary School in Uganda. “Rosie Giles, a former Headmistress at Marshwood School, has worked tirelessly for several years to better the lives of these school children in Uganda,” said Rotarian Bill Taylor, who organized the event. “We in the Rotary Club have been very impressed by the work being done there and decided to help. The children have a tremendous thirst for knowledge, but need better facilities within which to study, and we provided some funding for classroom building last year. We have worked with Rosie, with Anna Cope of Kilmington and with the Rotary Club of Mbarare in Uganda, and they in turn will ensure the monies are put to the use intended. These children now have a secure classroom within which they can learn and now need a clean water gathering and storage system which will mean they do not need to carry water, each day, several miles from a dirty river. Thank you to all who attended and contributed to making this a fun evening and a successful fundraising event”. 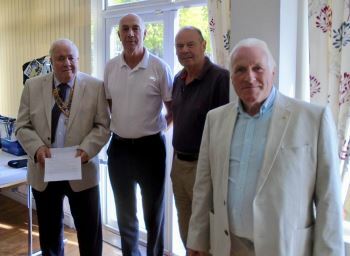 The Rotary Club of Lyme Regis held a collection in Lyme Regis and Charmouth on Saturday and collected £750 which has been sent to the Rotary District 1200 appeal for funds to help the victims of the Somerset Levels floods. This was a tremendous result and we would like to express our gratitude to all who contributed. 100% of these funds will be used to help with the clean-up effort and to meet needs where hardship and circumstances warrant specific aid. The distribution of these funds will be directed by Rotary. 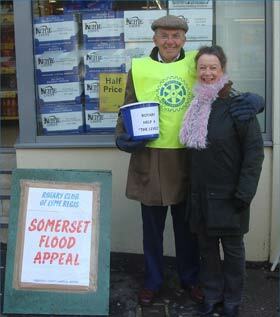 “Rotarians have been active in the flooded area of the Somerset Levels these past few weeks,” said Rotarian John McCallum. “They have been working with and under the direction of the emergency services, bringing relief where they can - building flood barriers, laying gravel paths to provide easier access to remaining residents (and funding the hire of diggers and dumper trucks to facilitate), providing sandwiches to relief workers, distributing much needed groceries and ‘stuff’ – all of them are volunteers. This will continue in the weeks ahead. The recent relentless stormy weather has reminded us all of just how much we rely on the RNLI for our safety at sea. Its not just sailors that benefit from the service. Recently we have seen a significant rise in the number of surfers, windsurfers, ski surfers, kayakers and swimmers etc. enjoying the waters of our beautiful bay, as well as fossil hunters on the shore between here and Charmouth. The Annual Soup and Ploughman’s, run by the Rotary Club of Lyme Regis attracted over 100 people to the Alexandra Hotel, Lyme Regis, on 27th January 2014 and raised over £1000 for Water Survival Box, the Rotary run disaster aid charity based in Somerset. Rotarian Ken Biggs, representing Water Survival Box, updated the diners on the work of the charity in the Philippines. An example of a Water Survival Box and contents was on display. Thanks to the Alexandra Hotel for their tremendous support for Rotary through hosting this event which was attended by the Mayor of Lyme Regis, Councillor Sally Holman. Not quite! We had gale force winds and torrential rain. Trees were down all over the place, floods at every corner, waves breaking over the Cobb. We received over a dozen phone calls and several emails on New Year’s Day morning asking if THE LUNGE was still on. Similar events all over Devon and Cornwall were cancelled ………..but not in Lyme Regis! Our intrepid Lifeboat Crew gave us the ‘thumbs up’, the Harbourmaster was OK with it going ahead. It was too windy for the changing tents and too stormy for the Safety Boat, but nothing was going to stop Lyme Regis Rotarians running THE LUNGE. Half a dozen or so volunteer Lifeboat Crew stood thigh deep in the water to ensure swimmers didn’t go in too far, plus we had two St John Ambulance crew on standby - just in case! Then it was all over just as fast as it started. LUNGERS came out of the surf laughing and smiling and saying what great fun they had just had, and we all looked on and said “Yeah, Right!” Then it was off to get a cup of Hot Soup courtesy of By the Bay Restaurant and a change of clothes. By 1330 it had all been cleared up, crowds were gone and you wouldn’t have known so many people had had so much fun on such a wet and windy day. As of the time of going to press we have collected or been promised over £4500 to Clic Sargent or other charities, including £2500 by the Leicestershire Ducks who collected for Cancer Research, McMillan Nurses, Battersea Dogs Home and the RNLI. WELL DONE TO ALL WHO TOOK THE PLUNGE AT THE LUNGE! Dec 31st 2012—gales and downpours. Jan 2nd 2013—dull, overcast, drizzle in parts. In between—Jan 1st 2013 —BRIGHT BLUE SKY, SUNSHINE, WARM, DRY—all the things we have been missing these past few months. A welcome change from last year, and it brightened us all up—I am sure you all recall the heavy rain throughout THE LUNGE 2012. The Rotary Club of Lyme Regis has once again presented dictionaries to all final year pupils at leaving ceremonies at St Michaels, Marshwood and Mrs Ethelstone’s Primary Schools. Rotarians in Lyme Regis have boosted the RNLI’s lifejacket appeal by £700, half the donations received during the Lyme Lunge on New Year’s Day. 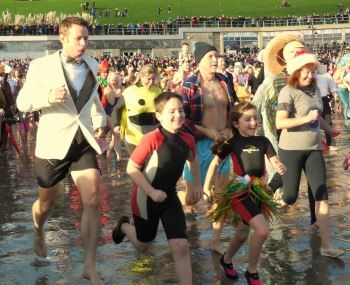 The Rotary Club has organised The Lunge – when dozens of brave souls dip at least their toes in the sea – for the past four years. 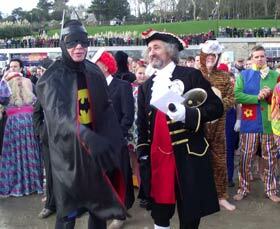 The Rotary Club of Lyme Regis has awarded ex Town Crier Phil Street the prestigious Paul Harris Fellowship. Within the Rotary movement in the UK the Paul Harris Fellowship is a much celebrated award, something that is presented by the local Rotary Club only after much deliberation. It was created in 1957 in memory of Paul Harris who, over 100 years ago, founded the Rotary movement. It has evolved over the years to also recognize contributions by non Rotarians to the well being of their communities and the wider world.